In today’s hectic and crazy world, it’s hard to even think about finding the time to just sit and practice mindfulness. For many, it’s a hard concept to grasp, and as a practice, it can feel intimidating to start. 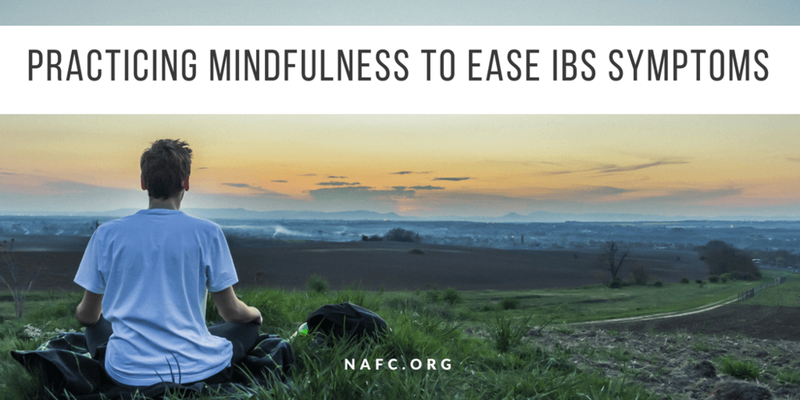 But carving out even 5-10 minutes of each day for some quite time can do wonders for your stress and anxiety levels, and may even help with things like IBS symptoms, simply by calming your mind and being objectively aware of how you’re feeling. Before you start practicing mindfulness, you need to know a bit about what to expect. The main goal of mindfulness is to be able to pay attention to the present moment you’re in, without judgment. This sounds pretty easy, but once you get started you’ll see it’s much harder than it appears. Your mind has a mind of it’s own and tends to drift toward all sorts of things except what’s happening to you right at this moment – that big work project coming up, the cupcakes you promised to make for your 3rd grader’s class this week, an upsetting conversation you had with a friend or family member, your growing to-do list, and on and on. But not to fear – your wandering mind is completely normal and it just takes some practice pulling your thoughts back to the present moment once you realize they’ve drifted off. Once you’re able to this in practice, you’ll find you’re better able to do it in real life too, making you more present in your day-to-day activities. Find a comfortable place to practice. This doesn’t have to be a picturesque seat in the middle of a garden or waterfall. It can be a comfortable chair in your kitchen, a quite spot outside, or even your desk chair in your office. The main thing is to find a place that feels good to you. Be sure that your body posture is comfortable too, and that you’re in a position that you can remain in for the length of your practice. Start with 5-10 minutes. This feels like a small amount of time, but is a great place to start when you’re trying to fit this practice into your day. And when you’re just getting started, trust us when we say that even 5-10 minutes may feel like a long time to just sit still. As you continue with your practice, you can begin to extend your time. Concentrate on your breathing. No need to count your breaths or hold it for a specific amount of time. Just feel your breath as you inhale and exhale slowly and regularly. If you feel your mind start to wander (and you will), just acknowledge it and then pull your concentration back to your breath. Don’t judge yourself or your feelings. This is hard work, and takes practice to be able to continually be present and not focus on the things that are happening in our lives. Practice makes perfect. Or at least it makes you better. With continued practice of mindfulness meditation, you’ll become much better at staying focused throughout and that will bleed into other areas of your life as well. We know it’s hard to sit still for a set time each day, but stay with it. The benefits are well worth it. Like this post? You'll probably enjoy these too!